Liquitex offers the broadest range of acrylic mediums to inspire creativity at every stage of the painting process. Surface Prep Mediums are used to seal prime and add tooth (for color adhesion) to all surfaces such as canvas wood paper and metal.... Surface Preparations are used to seal, prime and add tooth (for colour adhesion) to all surfaces such as canvas, wood, paper and metal. This same preparation is used for both acrylic and oil paint. 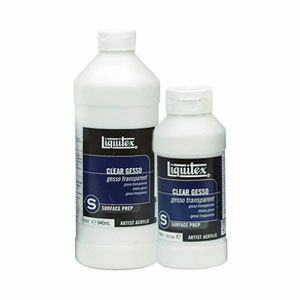 Liquitex Basics Acrylic Gesso is formulated to produce a smooth, absorbent, finely textured ground for painting on most porous surfaces, including canvas, paper, fabric, wood, or plaster. This gesso does not require thinning for proper consistency.